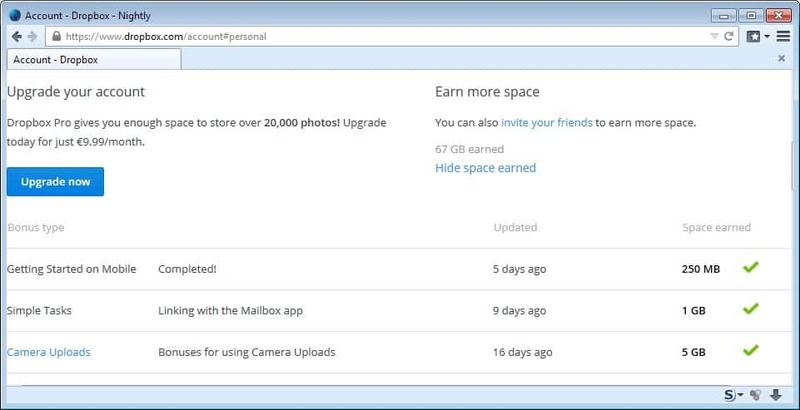 If you are using a free Dropbox account you know that you can increase the meager starting storage through various activities such as referring other users, enabling features such as Camera Uploads, or installing the Dropbox mobile application on your mobile phone or device of choice. Dropbox launched the Maibox application for Android recently, and while it did not offer any storage bonus at the time of launch, it appears that the company decided to award users who link the Mailbox app to the Dropbox account with 1 Gigabyte of extra space. If you have been using the Mailbox iOS application you know that this was the case there for some time now. What this means in effect is that you will get 1 GB of Dropbox space if you install the Mailbox app on iOS or Android, and link it to your Dropbox account in the process. Please note that enabling Camera Uploads will get you 5 GB of storage space currently, at least when you do so on Android devices. Here you find all storage space rewards listed that you have earned in the past. The first thing you need to do is head over to the Google Play store and install the Mailbox app from there. You can alternatively use the Play store application if it is installed on your device to do the same. Note that it is compatible with Android 4.0.3 and newer only. 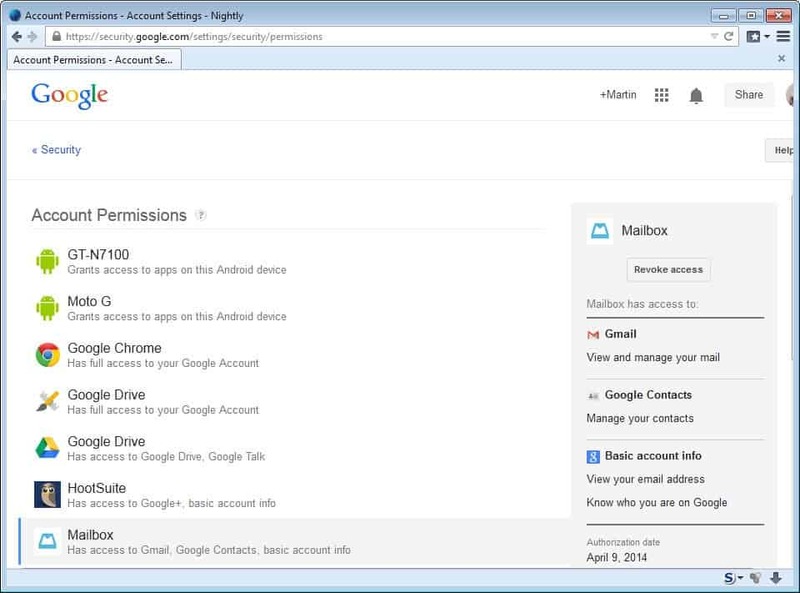 You are automatically asked to add a Gmail account to Mailbox by entering your Google login name and password, and allowing the app access to the account. Once done, you may link the app to Dropbox which gets you the 1 GB of storage space. You can unlink the application again once Dropbox lists the 1GB of extra storage on its account page. You may do so on the Account Permissions page of your Google account. Just click on this link to open it right away, or open the Google website manually, click on your account picture at the top, select account, then Security, and on that page view all under account permissions. Note that it is not enough to uninstall the app on your mobile device, as the permissions remain unless you revoke access. One Gigabyte of extra storage space may not look like much, but if you consider that you start with 2 Gigabyte on Dropbox, it may add up to 50% additional storage space to your account. If you install the Mailbox application on your mobile phone and link it to Dropbox, you get 1 Gigabyte of extra space. Got 1GB bonus immediately on launching Mailbox app (have Dropbox installed and it detected it), didn’t need to add gmail account to it. Btw camera uploads only give 3GB, I think 5GB was for beta testers or something. There was a 5GB camera uploads bonus 2 years ago as well (or is this the same one just extended indefinitely?). It’s the same one. I think if you were in beta test for camera uploads you can earn up to 5GB from them, those who started to use it after it went stable (like me) can earn up to 3GB. I am signed in to my Gmail acct. I should be ok+, right? Are the 1GB for using Mailbox app and 3/5 GB from using Camera Upload permanent or just for 1 year? And after you get the free GB, if you stop using Mailbox or Camera Upload, does Dropbox take the GB back? Having received the 5GB for the camera upload(s) 2 years ago, I can most definitely confirm that it is permanent. The 1GB from the Mailbox app did not disappear once I got rid of the app and seems to be permanent as well. “3.Once done, you may link the app to Dropbox which gets you the 1 GB of storage space.” – I can’t find anything in the Mailbox settings for this. Where is the link? Just sign into the app with your Dropbox credentials – no need to add an email or anything. Just sign in after installing and running the app. It’s that simple. any tips to increase the very low free start up allowance on dropbox is welcome, thanks! I signed up for Dropbox about 4 years ago and somehow have gotten 26 gigs of space idk but there good to there loyal subscribers I guess!